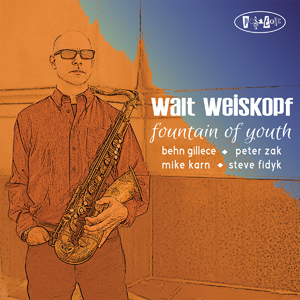 Walt Weiskopf is a seasoned tenor saxophonist and composer, and a Steely Dan member. His latest CD, Fountain of Youth, his fourth for Posi-tone Records, appears to be his 17th recording, starting with New Zealand in 1985. His oeuvre charts a wealth of originals and and unique takes on American and British standards. This CD is no exception with his pensive and somewhat haunting reading of How Are Things in Glocca Morra from Finian's Rainbow. as well as his engaging lope through Johnny Mandel's Close Enough For Love with its slightly unusual phrase lengths and harmonic scheme. The left-handed metre beneath the wistful melody on his tune Petal makes for a magnificent aural experience as does his uptempo blues romp, Hot Dog Days. The only slight niggle that I might proffer is the medium tempo version of David Raksin's classic, Laura. While swinging nicely with a rich chord sequence to improvise on, it did begin as a ballad - and should probably remain one. This is because the lyrics, message and general ethos of the song are most effectively communicated at a slow (one beat per second) tempo. Jazz instrumentalists, of course, have made a long tradition of double timing ballads like Body and Soul, Misty, When Sonny Gets Blue, etc, not to mention "latinising" chestnuts like My Funny Valentine, Moonlight Serenade and Naima, et al. Sadly, this alters the inherent character of the song for me. This grumble aside, the most striking aspect of Weiskopf's musical persona is his dry, vibrato-less yet wistful tonal quality that has a searing emotionality about it, which resonates equally in his interpretations of his own pieces as well as those of others. Not an easy feat to pull off. The lineup includes vibist, Behn Gillece, Peter Zak on piano, bassist Mike Karn and Steve Fidyk on drums.The additon of Gillece's propelling vibes offers a welcome change into the Weiskophian lineup which has tended to linger towards another horn or two. The regal voice of Zaks' solo on Close Enough For Love brings echoes of the richly stated melodic royalty of the late Hank Jones - always welcome here. A "fountain of youth" indeed, which would render even the 16th century conquistador Ponce De Leon proud. A profound listen that refreshes. Grab it.